Is Flog It! 's Paul Martin a secret green ninja activist? The Singer, the Cook, his Kebabs and a Box of Ready Made Masala. The TESCO tonnes - can their food waste be a good thing? With so much blood letting going on in the US elections and our referendum, the less blood thirsty amongst you may think it's definitely time to reduce your meat intake. One solution could be to take our Simply Vegan course. We set this up because of the number of people contacting us wishing to reduce their meat and dairy intake without losing their interest in eating food altogether. A little spice can go a long way to pacifying carnivorous pangs. Here's a tip for those of you who think you may miss the texture and resistance of a meaty mouthful. Take some chickpea flour and add some herbs or spices according to the style of your dish. Add a little turmeric powder to give it a little colour. Season, add water and mix into a fairly stiff dough. Roll out into a 2-3 mm thick sheet and cut into bite size shapes. Whether you're making a spicy dal or an Italian ragu (saucy dishes generally) add these pieces and gently simmer them for the last 10 minutes. My grandmother would prefer to roll the dough into a cylinder and break off chunks into the dish being cooked. As well as adding a little bite to the dish they will also help thicken it. Talking of vegans, one major Italian city is sending a message right from the top to encourage eating less meat on health grounds. It's not to everyone's taste as you can see (particularly livestock producers and meat processors) but then at least vegetarian dishes are already well represented in the canon of Italian cuisine. Wonder how such a thing would go down in the UK? Not sure if anyone paid any attention to World Ocean Day but in the spirit of sustainability here is a simple snack I shared with some Keralans recently. First ask your fishmonger for some fish heads - these were sea bass - they'll probably give you them free or for next to nothing. Score them a bit and rub a little paste of cumin, coriander, chili powders, lime juice, garlic and ginger and salt. Marinade for half an hour or so and then deep fry for a couple of minutes. You have to take a little care while eating obviously as it is mainly bone. There are generally enough fleshy bits like the cheeks to reward the effort but you do produce a lot of mouth debris. Eat by the beach would be my suggestion and enjoy spitting the bony shards out to sea. Who knows, in the future as we slurp down jellyfish fingers, we may well look longingly back upon those fish heads as a treasured culinary memory. It's one of Rock's less well known stories that I cooked for BB King.The great man was playing at the university union and at the time Leeds Refectory was the biggest music venue in West Yorkshire. We, the ENTS catering team, decided to cook him chicken - a chicken and pineapple stew to be precise. Such a dish would melt his broken bluesman heart with its sweet 'cajun' overtones and transport him instantly back home to the Mississippi. You should know this was pre-internet with no way of checking exactly what 'cajun' style entailed without going to the library and reading a book about cuisines of the Southern States. We were students so who could be bothered to do that? It was very rare that a visiting artist would pop into our kitchen backstage; Mick Hucknall didn't nor Lemmy or Suggs. Joey Ramone may have wanted to but when I saw him he appeared incapable of standing up, or talking (and that was before his gig), while Shane MacGowan didn't take his nourishment from solid food. So it was with surprise and delight when the great man himself shuffled into the kitchen demanding to know "whaz the food?". Immediately on first initial terms I said, "Well BB, we've got chicken. With pineapple", and lifted the pot lid with a flourish. He was a big man and as he leant forward into a big cloud of steam and inhaled he let out a sigh that could only be interpreted as being part despair/part sorrow. "Ughhh, chicken..." It was the sound of a man fed 'cajun style' chicken and fruit based combinations night after night, week after week touring university venues across Britain. The antiques show 'Flog It!' doesn't sound like your obvious source for food policy matters but the latest edition had an interview with the daughter of the graphic deisgner Abram Games. He was an official WW2 war artist and several of his works have a strong food message. Even before the Great War, thanks to the colonies, Britain was a major of ingredients like rice, sugar, spices and beef. However, with supply lines distrupted by U boats and shipping needed for other uses, citizens were urged to look to themselves to get the food in. The message of the poster above is clear and stylishly presented, self-reliance is the only way. This idea of a self sufficient Britain lasted long after the war, certainly it was a political issue when I was young. Things are very different today, once again we import huge amounts of food by air, road and sea from all over the world and from countries with their own malnourished populations or where water is scarce or people are displaced to make way for new landowners. Once again this old poster becomes relevant. Growing your own might not be the answer to all our food needs but it makes us less of a burden on other people. In a few weeks time the rather genius pop-up, Tincan, will be shutting its doors and relocating to New York. It's been a brilliant coup - a restaurant selling tinned seafood slap bang in the middle of London's West End, and without doubt better then most of the fare on offer around it. Personally I've always been fascinated by food in tins. My mother, a good but unadventurous home cook, never really had the courage to attempt anything English beyond egg and chips or draw on the huge range of tinned products available in the seventies. Her meals were limited to Indian and pretty much cooked from scratch so eating anything canned was to glimpse into an exotic world of pleasure. Even then the range was limited; baked beans, soup and occasionally sardines and tinned peach slices. Not for us tinned spaghetti and meatballs or spam or vegetables of any sort (definitely not potatoes - a concept I still find disturbing). Talk about being a slow learner, it wasn't until my mid 20's that I first tried Heinz Macaroni Cheese though it was well worth the wait. I can distinctly remember being beguiled by its pale, sticky blandness and mystery chemical taint that could surely only have been attained using illegal food additives. It was (is) a great canvas for culinary experimentation. I can lay claim to having invented several dishes - in particular macaroni cheese simmered with chips and garnished with chopped pickled gherkins (a little tang to cut across the mass of sticky carb) and a 'delux' version with tuna (tinned obviously) mixed in. Of course it's easy to behave stupidly around tins. During a period of anxiety, revising for my undergraduate exams, my sister told me to eat fish - it was good for the brain, she said. I bought 20 cans of tuna and my method was to eat one raw for breakfast and one cooked as an evening meal. I lasted four and a half days before succumbing to feelings of nausea and depressive thoughts. Acknowledging my weakness, I resigned myself to producing an extremely mediocre academic performance instead. To add an extra helping of abuse she clarified her advice saying, "fresh fish, you idiot, not tinned". The tin can and canning process really took off in Europe in the early part of the nineteeth centurry. 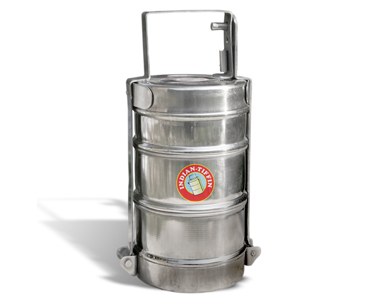 Not quite as old is the Indian variant - the Tiffin Tin or dabba. This is a kind of multi-tiered tin can only with the added bonus of being reusable; three or more small metal containers sit snugly one atop another all bound together by a metal clasp. This simple stacking system has allowed generations of wives to send a home cooked lunch to their husbands working in the heart of the city. More often than not, lunches today will be prepared by companies but still, spend any time in Mumbai and you will see the Nehru hatted Dabbawallahs ferrying tiffin tins to their office destinations. They're an eye catching bunch in their white shirts and Nehru hats as they gather to share out their rounds before attaching a dozen or more wire handled canisters to their bicycles and dispersing into the traffic. Everything about the process seems anachronistic, from the uniforms to the simple coding system at the heart of their delivery system. Yet each year millions of lunches are delivered with barely a fault in one of the most congested cities in the world. It sums up perfectly the enigma of India; how out of the chaos and seemingly impossible, comes something simple and perfect, something greater than the sum of its parts. 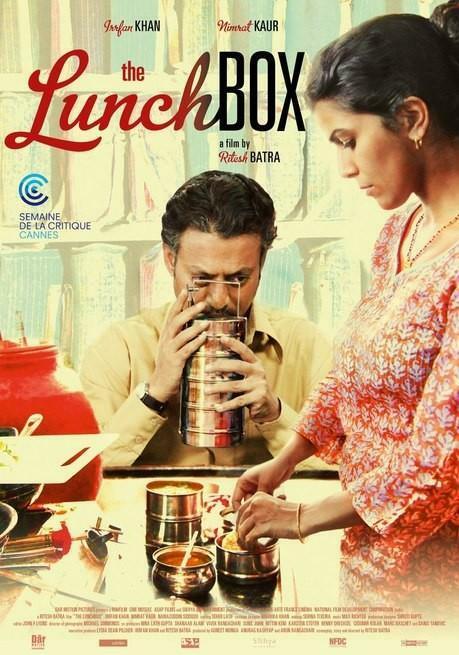 If you like a little romance with your Indian take away then you must watch The Lunchbox. I saw it twice on a flight recently - outbound and inbound - and it's now my favourite foody film. The plot revolves around a simple mistake. A tiffin lunch delivered to the wrong person. This in itself is a curiosity worthy of exploration given how rare this actually is. The food is received with surprise and much pleasure by Saajan, a widower, whose normal tiffin, of mundane fare, is provided by a local cafeteria. The cook responsible for this treat is Ila, a woman on the cusp of middle age. Married with a young daughter of school age, she feels she is becoming distant from her husband. Taking advice from her 'aunty' one floor up in the block she lives in, she attempts to rekindle their love for each other starting with his lunch. Alas despite her best efforts he doesn't notice since he now is also receiving a tiffin from another source (the cafeteria formally supplying our hero). Mumbai is a bully of a city and its most abundant and hapless victims are commuters. In connivance with wealthy landowners in whose vested interest it is, the city remains located on a tatty, ear shaped piece of land detached from the wide open spaces of New Mumbai across the water. As the film brilliantly captures, the reality for millions of commuters is several hours of misery each day crammed nose to armpit in trains or sitting trapped in congestion on the roads. The intractability of carving a niche in this city is matched by the even trickier negotiation of personal relationships outside of family and cultural norms. Ila's husband's detachment towards her is not strictly brought on by the strain of commuting. There is another woman on the scene and Ila foresees her life becoming one of subservience and invisibility. A captivating story line is literally delivered by the dabbawallahs and with plenty of food to tantalize; peas kachori, stuffed bitter gourd, a fragrant masala rice studded with shiny whole red peanuts, a rich yellow dal topped with succulent tomato. What's more Sajaan is so mannered in his ways that even watching him eat is pleasurable. There are also culinary insights into the real lives of Mumbaikars survive in the city from the frugal lunching on bananas to the commuters who save time by chopping their vegetables on the train home. The scenes of the dabbawallahs singing on their way home feels timeless but what of the future of this service? While tiffins remain popular in Mumbai changes are happening which may make my photos, taken in 1997, a less common sight. Commercial providers of tiffins are finding that increasingly customers no longer like their food served in the traditional steel containers. They want disposable ones which are perceived as being more hygienic. If there's no need to recycle the containers then what becomes of the carriers? If you only need someone to deliver then you lose the magic of the system. And perhaps someone's chance of falling in love. Back then an increasingly well travelled, culturally informed, domestic population was waking up to the pleasures of this delicate and versatile herb. Today pretty much all the main supermarkets stock 'ethnic' produce from eddoes to galangal and alphonso mangoes, much of it air freighted and in the shops in just a few days from harvest. I don’t hear any complaints from my mother now and what’s more she doesn’t agonise over the details like transportation and how exactly we in the West are able to enjoy produce of a better quality than people in the country it is grown in. I, however, still do and so when I discovered that there was a farmer in Lincolnshire growing not only coriander but also small aubergines, chillies, mooli, saag and bitter gourds for the UK market I was intrigued. That was ten years ago but when I met Colin Martin I was amazed to discover that he had been growing these 'specialist' crops for three decades. Colin is based in Spalding, the heartland of Britain’s potato and onion production. Back in the early 70’s Colin received a telephone call from a Pakistani fruit and vegetable company based in Bradford. Could he, they wondered, grow vegetables favoured by Asians? Colin travelled to Bradford to meet Rafi, the late owner of Rafi and Company Ltd. By then Bradford has established itself as the main centre for Pakistanis in the north of England and demand for fresh, familiar produce was high at the household level and starting to increase in the restaurant trade. So, having established what varieties were to be grown and just how feasible it all was, a business friendship was born that has spanned 4 decades. So fruitful has it been that from the original 5 acres set aside for them, Colin now farms 700 acres in Lincolnshire and Portugal, with 80% of his herbs and vegetables for the ethnic market. The rest goes to ASDA. To put this into perspective, for the same period of time Colin has been supplying Bradford with his British coriander, horticultural production in the UK has halved - self-sufficiency is not part of the UK government’s food policy. Reducing greenhouse gas emissions and ensuring access to healthy food is. Colin does both, allowing consumers to buy vegetables just one day after harvest. And it's grown in British soil with all that implies for the UK's water footprint and other environmental considerations here and abroad. Colin is a real farming entrepreneur. He diversified when he had to, takes an interest in both his product and clientele, and does his best to minimise resource use while maintaining an honest product. Honesty is a quality demanded by consumers, campaigning groups and (some) retailers. Less so by our policy makers. In their drive to meet greenhouse gas targets recent Governments have been happy to talk up how much UK emissions have fallen in recent years. However this has been met in no small by our importing much of our horticulture leaving other countries to shoulder most of the environmental burden. A few years ago I helped develop a curry sauce recipe for the trendy 'wholesome' fast food chain Leon. Now I've been doing the same thing for ASDA. Not quite so cuddly; they're currently number 2 in the supermarket rankings, a real giant of the corporate world. I was asked by a food manufacturer to help them develop recipes for a range of premium Indian ready meals for ASDA including a chicken balti. Whatever the dish and whoever for, the challenge is the same; how to replicate 'authenticity' on a vast scale working to strict budgets, using bulk ingredients - pre-prepared in the case of garlic and ginger, in massive cooking vessels and without the 'love' factor that all good food needs. What's more it has to match the retailers view of what customers expect of such a dish. Unfortunately for the most part this still remains trapped like a fly in amber in some 1980's lurid red, sticky, tomato based sauce; flock wallpaper in a bowl. I say this based on what was shown to me in the development kitchen. The balti dish I was asked to work on was made with a 'balti paste' procured in good faith from a company boasting of its attention to detail when roasting chillies etc. It tasted of the sherbert lemon sweets I ate as a kid - far too acidic but with a chili kick. I suggested ditching their use of this and to his credit this is exactly what Development Chef Richard Pearson has done. Instead he's chosen to follow a method I demonstrated. A balti is typically cooked on high heat in a short space of time in a karahi or wok. One common method is to boil chicken and spices first for 5 or so minutes before adding oil and cooking for a few minutes more (red meats like lamb tend to be pre-cooked first). It's an unusual technique and the opposite to what is done in much of South Asia. Of course it's the all important spice mix which is key to the taste. In Kashmir where baltis are thought to have originated, people make a basaar (or masala) rich with asfatoeida which is native to the area and also fenugreek - both seed and the dried leaves. This combination gives the balti its distinctive taste and fragrance. If you want to cook a very quick curry then this is the technique for you. Adding the oil near the end of the cooking process gives the lovely glistening browned meat. Drain off any excess oil before serving. Once you've cracked the spicing the challenge is to recreate the searing heat required on an industrial scale. The manufacturers plan is to cook the sauce in huge 'kettles' separate from the chicken. Straight away this factors in problems when trying to recreate a dish, that there will be no meat juices flavouring the sauce in the normal way. So other techniques are used to recreate what happens on the small scale, using meat glazes etc. These less familiar names are often what confuse and concerns shoppers when they read the list of ingredients on the side of a ready meal pack. I saw nothing to fear or arouse suspicon on Richard's cooking list - beyond the mysterious 'balti-paste' which was jettisoned. Naturally I will be very interested to taste what his team finally comes up with. As much as foodies love to loathe ready meals they serve they serve an important role in the diet of millions of people in this country. Why else would they called convenience food? No matter what you feel about the lack of domestic science provision in schools, they help those people with no culinary skills to feed themselves. And there's a strong argument to say that they are the most energy efficient way to feed us all. If you've ever seen Qawwali singers in action you can easily imagine them working up a serious appetite. A Qawwali 'Party' comprises of a main singer and his 'support - other male singers who provide a clapping accompaniment. The performance is charged with energy and the whole effect is mesmeric. Once 'in the zone' they can sing their devotional songs of praise for hours and Nusrat Fateh ali Khan remains the most famous exponent of recent times. Nusrat was a man with a large appetite for devotion... and food. After his concerts, particularly at the Hackney Empire in London, the eatery of choice for Nusrat was the Lahore One Kebab House (218 Commercial Road). The owner Mohammed Anjum is, in his own way, a patron of the arts and was always delighted to host Nusrat and his band of singers. I've visited several times and am happy to see his restaurant is well reviewed. If you ever go, try the kheer; I've never really been a huge fan of rice pudding but theirs is truly delicious - incredibly thick and creamy. Of course in this part of London it's all about the kebabs. Mohammed's is one of several Pakistani restaurants in the area - the most well known being the Lahore Kebab House on Umberston Street. This restaurant has undergone a transformation since my first visit and is now a spacious, glistening, stone clad version of its former self. It's easy to bemoan the loss of 'character' in a place but it is a far cry from the cramped, dingy original restaurant. I worked with head chef Mohammed Azeem on the Madhur Jaffrey series "Curry Nation" and if you ever wondered how it is that restaurants are always able to create the same taste then here's the very simple answer - they use packets of ready mixed spices - from memory it was 'Shan' spices. This was a real surprise to me given that I thought they'd have closely guarded recipes for their spice mixes. What has happened is a revolution in spicing which has really gone by unnoticed. Vacuum packing mean that restaurants in the UK, and for anywhere else on the globe for that matter, can buy freshly ground spice mixtures. Gone are the days of tubs of 'Curry Powder' or generic 'Madras' . Nowadays you can get spice mixtures for all sorts of styles and even specific ingredients. Restaurants love them as they get a good, consistent tasting product that also saves time and you too can use them and get that same 'curry house' taste. The downside is blandness - in the sense of uniformity (you'd never describe Mohammed's food as tasting bland!). I watched him cook a 'Nihari', (curried lamb shanks) a real favourite amongst Pakistanis. To make the sauce he used Shan's Nihari mixture combined with a few extra spices - chilli, cumin, coriander etc. For the Nihari recipe we were writing for the 'Curry Nation' book we couldn't exactly say, now add a box of Nihari spice mix". Hardly Madhur Jaffrey. So I drew on the list of ingredients on the box and one of Madhur's own nihari recipes to devise something that was not an exact copy and could be made from relatively common spices - without 'long pepper' for example. I think what we created for the book has an excellent flavour and is true to the nihari 'style'. It does beg the question what is 'authentic'?, apart from an experience sought after by Indian food aficianados. Of course the answer to that is - no one really knows. TESCO's 'confessions of a supermarket' has quite rightly generated a great deal of fury amongst consumers. Aside from the staggering amounts of waste associated with shopping at their outlets, its also not just them. Is it less annoying that Waitrose and M+S create huge amounts of food waste? No. Will they be publishing their dirty secrets as well? Let's hope so. I couldn't find any real data. M+S do say however that produce that doesn't make the grade for their stores goes to 'Company Shops' or is redistributed to charities. What I find annoying about TESCO's data is its presentation. According to the food waste hotspots it focused on - Bananas, Grapes, Bagged Salads, Apples and Bakery, its retail waste is barely 1% - a bit more for Bakery. You can see the retail figure next to their logo, dwarfed by the waste figures related to agriculture, processing and us the consumer. It's as if they've dissociated themselves from any responsibility. No one's fooled. Confusion over use by/sell by dates, BOGOF's, the demand for fruit and veg perfection ... all of these things collude to whittle away what's grown and what's actually eaten. TESCO helped fund the Sustainable Consumption Institute at Manchester University - set up in 2007, so it makes you wonder why they've been so slow to change their practices. Of course we can't leave the consumer out of the waste chain. There won't be many saintly types who only buy and eat what they need. The person in this BBC clip is probably representative of many and succumbs to the western disease of over consumption. Food is slung through fear that it is off, the carrots have gone rubbery or the cheese faintly flushed with mould. According to recent UN report on food waste, one third of the food produced on the planet for us humans is wasted - about 1.3 billions of tonnes. It also says wealthy countries waste more food after consumers purchase it. It's the other way round for poorer countries where more food is wasted in storage and handling. The numbers are mind boggling. Put another way we could give 1 tonne of food to 1.3 billion very hungry people. Or half a tonne to 2.6 billion people, a quarter of a tonne to 5.2 billion people - whatever, you get the gist. We could feed most of the current population of the world just on our waste food. Bonkers. Back in 2004/ 2005 I worked for DEFRA on their 'Shopping Trolley Report' looking at the environmental impacts of commonly purchased food items. For a few years after there were a lot of buzz words about 'carbon footprints', 'food chains' and 'life cycle assessment', 'field to fork' etc. Then in 2007 the financial markets went belly up and since then minds have tended to focus on job security and cuts of various kinds. Now that they've released these figures, TESCO and the other supermarkets will be forced to act. Food waste and sustainability is back in the headlines and supermarkets, with all the power they wield over production, hate those kind of headlines. What's more, after bankers/MPs expenses etc, the general public has never been less forgiving. Supermarkets have to rethink how they impose their will along the food chain. These are still tough times for millions of householders, now facing huge energy price hikes. But food waste can become a totem for effective change and that has to be a good thing. The recent UK news has been full of talk of poverty. Poverty means different things depending on where you are in the world. Of course the UK is far more wealthy than most countries but it doesn't make it any easier if for those living below (or just above) the Government's benchmark figure. On average in the UK we spend about 12% of what the UN calls "private consumption expenditure", or dosh to you and I, on food. The rest goes on clothes, pub, the car etc. It's a figure that has decreased throughout the last century but you only need to consider how in poor countries today people may spend 70% or more on food to get a sense of what things were once like here. According to the USDA us Brits spend less on food then Italians. Does that make us a wealthier nation? (Some might say so given the current state of their economy though others might say ours is just less brittle). But never mind the quantity what about the quality? Apparently we eat four times as many potatoes - which are cheap - while they spend more on fruit and veg. I'm a strong advocate of chips and gravy so have happily contributed to this spike in the data. But carbs are also cheaper so appeal to people with less dosh - filling and cheap. But it's the calories, stupid. The UN recommends that humans need a daily intake of around 2100 calories - a target which bar a few is not even attained by low income countries. The States almost doubles that figure with an intake of 3,730 but in another twist Ireland, with it's per capita at the lower end of the rich country list, has an intake of of 3,837. Whereas very rich Japan has an intake of 2,900. Barring sumo wrestlers how many obese Japanese people do you come across? High fish and high veg intakes mark their diet while us Brits, Yanks and Irish all tuck into energy dense meat and dairy products. And a lot of it turned into processed, saturated, cheap products rich in carbs and easy to eat. Which is why this is where the obese people are. The coalition government say we should be taking more personal responsibility for our diet while opponents argue that what and how we consume is being taking further out of our control by industry and clever marketing - you never get bogofs on fresh vegetables for example - check out Tesco's special offers as of this date below. Look closely and you'll spot the cucumber. However there is a key argument which gets lost when talking about both obesity and poverty and that is reducing meat consumption. Certainly the 'V' word is seen as way too scary and tyranical. The fact that people have to call it Vegetarianism shows you how lost we are in this country. In India it's just eating! There's all sorts of reasons and excuses given for this but the fact remains that for both human health and that of the environment, meat and dairy is killing us. So what to do? Get skilled. Keep an eye out for "Veggie Wednesdays" with discounted prices for Beginners and Advanced Veggie Heaven courses.